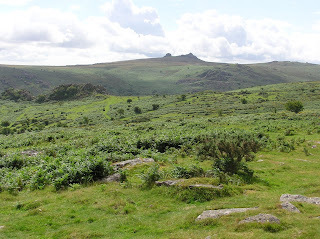 Killer Characters: A Typical Day in Gipping-on-Plym by Vicky Hill, reporter extraordinaire! A Typical Day in Gipping-on-Plym by Vicky Hill, reporter extraordinaire! Everyone makes the same mistake at first. They think that being an obituary reporter for the Gipping Gazette in the wilds of the Devonshire countryside has to be dead boring (pardon the pun). They also ask why a city girl like me would want to live in such a remote part of England, far away from the bright lights of Newcastle. The truth is, as daughter of The Fog—the most famous silver of thief of all time—things at home became a bit tricky and I didn’t want to flee to Spain and spend my life as a fugitive. I’ve always wanted to be an investigative reporter like Christiane Amanpour who now has her very own TV show. True, Gipping-on-Plym is far away from the front lines of Afghanistan, but everyone has to start somewhere. Besides, we get our fair share of murder and mayhem. Take this morning’s riot down at the newly installed pedestrian crossing in the neighboring hamlet of Pennymoor. Luckily the anonymous tip-off came in when my rival, Annabel Lake, was in the loo plastering on more make-up. Pennymoor boasts The Nag and Bucket pub, a Post Office and many picturesque thatched cottages. It used to be a peaceful hamlet where you could sit outside and have a pint of Scrumpy on a summer evening until someone realized the two-lane road provided an excellent shortcut between Totnes and Lower Gipping. Heavy lorries started rumbling through, destroying the tranquility, polluting the air and wreaking havoc on the cobbled pavements. Crossing the road was tantamount to suicide since the vehicles ignored the speed limit of 25 mph and would thunder on by sending up clouds of toxic fumes. Although the odious Eunice Pratt is not one of my favorite people, she had petitioned tirelessly for years to get the road prohibited to heavy traffic but unfortunately her efforts back-fired. Instead of closing the road to HGV’s, Gipping County Council installed a new pedestrian crosswalk complete with a button and flashing light. Furious, Eunice rounded up a group of her friends. Each time the traffic light turned red and the little green man flashed up telling them it was safe to cross, they’d slowly walk over with their banners. The moment the light turned green, another protester hit the button again. By the time I got down there, the traffic was backed up seven whole miles and the atmosphere was nothing short of murderous. The police arrived shortly after I did to stand guard over the button. I got a few good quotes—“We have a democratic right to cross the road!” said Mr. A. Fuller, age 77—and “The lorries are using it as a rat run,” claimed Mrs. M. Berry, age 65. Eunice Pratt was taken away in handcuffs but not before she had smashed two headlights and hit a driver—silly enough to get out of his car—with her handbag. After such an intense morning, I have to admit that sometimes a quiet afternoon funeral at St. Peter’s the Martyr overlooking the beauty of Dartmoor, is a lovely end to the day. Note from the author, Hannah Dennison: Vicky wanted to mention that this story is not an extract from any of her three adventures—A VICKY HILL EXCLUSIVE!, SCOOP! and EXPOSE! I would love to visit Pennymoor and have tea with Vicky Hill. I've just purchased the Mercy Messenger in Mercy South Carolina where my stepmother Jillian Hart is always getting involved in murder. So we need someone to write our obits! Love you, Vicky and your adventures. Great photos and roadway adventure. MJ, are you going to let Charlotte talk to you that way? Sounds like things are far from boring in Gipping on Plym! I'd love to visit the Nag and Bucket pub. Sounds like my kind of place. Thanks for stopping by - folks. Kara - I visited South Carolina and fell in love with the place. I have a feeling a funeral there would be just as exciting as those in Gipping-on-Plym. MJ - The feeling is mutual - I love Charlotte Adams! Shel - Yep! You're sure right about that. So that's what you do, Vicky. I knew you worked as a reporter, just not what kind. I haven't met Vicky yet and can't wait to read about her adventures.